Youngsville third-baseman Jason Beers never loses focus despite losing his footing stepping on third, firing a strike to first-baseman Alex Kemery to complete a double play that ended the top of the sixth inning during Wednesday’s game against Jamestown. For the second time in as many games, the Youngsville Eagles staged a big rally. But for the second game in a row, they came up just short. Trailing 5-0 after three innings against Jamestown on Wednesday, the Eagles got within 5-4 and had the tying run on third base with two outs in the bottom of the seventh, but Chase McLaughlin was able to induce a strikeout to end a chilly affair at Davis St. Field. McLaughlin came on in relief of Jed Goodlin, who reached the 100-pitch limit after 6 2/3 innings. Trailing 5-3 with two outs, Sam Hoover walked and pinch-runner Brysten Turner went to third on Jake DeSimone’s single and a throwing error on the play, with DeSimone advancing to second. Turner scored on a wild pitch and DeSimone got to third, but McLaughlin was able to finish it. The late-game drama was hard to see coming, as Goodlin’s two-run double and a wild pitch that allowed him to score made it 3-0 in the first inning. Sam Hoover came in on the mound in the second inning and, outside of the third inning, was terrific. Run-scoring doubles from the Muskies’ (2-3 overall, 1-0 Region 1) Colin Wilson and Hank Fisher made it 5-0 in the third inning, but that was it for Jamestown, as Hoover settled in. He faced just one over the minimum over the final three innings, including three strikeouts, including a nifty double play turned by second baseman Dominick Walton to end the sixth. 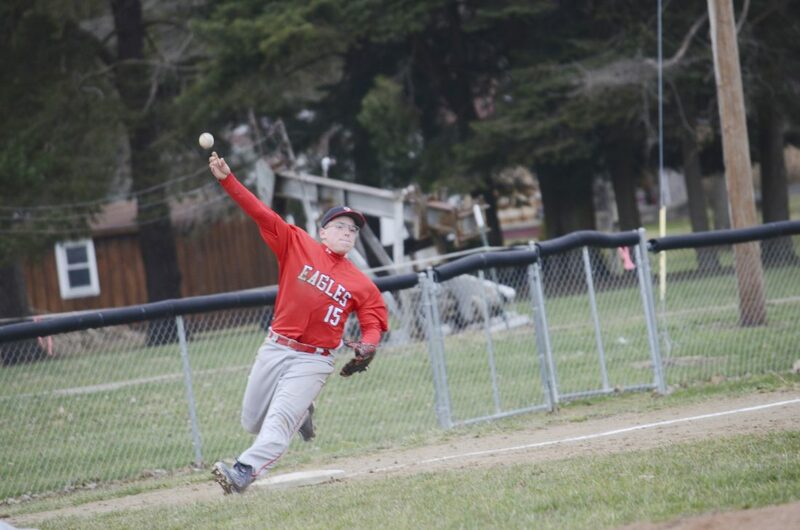 The Eagles (2-3, 0-1) had just one hit off Goodlin in the first three innings, but their bats came alive in the cold weather (game-time temperature was 40 degrees). With 1-out in the fourth inning, DeSimone was hit by a Goodlin pinch and pinch-runner Ethan Curry went to second on Damon Reese’s single. After Goodlin got a strikeout for the second out, Walton followed with a swinging bunt-single and Curry scored on a throwing error on the play. Goodlin pitched a scoreless fifth, but the Eagles struck for two more runs in the sixth to get within 5-3. DeSimone led off the frame with a double, went to third on a groundout and scored on an error. Isaac Smith singled two batters later, stole second and scored on Alex Kemery’s RBI single to cut the deficit to two before Goodlin got a strikeout to end the inning. DeSimone led the Youngsville offense with a pair of hits, while Hoover struck out three and didn’t issue a walk in his six innings of work. Goodlin struck out eight and walked one in getting the win. The Eagles look to bounce back on Friday when they host Union City.